In a scene seemingly cut from a classic romance film, a male and female humpback whale court and dance underwater in preparation for mating season. In the video below you see this dance, a dance not frequently seen by any human, that appears to be an attempt at impressing the female, according to BBC Earth. However, their romantic interlude is cut short when several other male whales appear on the scene and vie for the attention of the female. The romantic waltz of the male and female has turned into a Paso Doble, a bullfight or sorts, between the male humpback whales. During the battle the males fight to get beside the female and then show off their masculinity by ramming into each other, slapping their tails and jumping from the water. 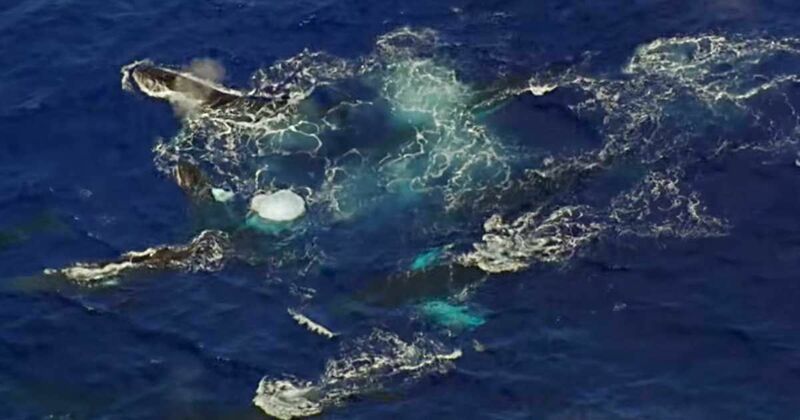 With most humpback whales weighing around 40 tons (about 80,000 pounds), the collisions can be explosive. BBC News reports that when males ram into each other, the force can be deadly. "It's a violent behavior. So violent that there are records of males killing one another," Dr. Ted Oakes told BBC. Female humpback whales let males know they are ready to mate by singing, releasing a scent, and slapping the water. This is when the competition typically begins. Researchers have observed what they believe is a mating ritual in which the female swims away and has the males chase her, fighting (with increasing intensity) for a position near her tale, according to BBC. In this particular battle, the largest whale won the war and the right to mate with the female.